You've got a message the world needs! The Blog Connection will help you optimize your message and successfully grow your message into a missional, income earning business, all while working from home in your free time. Remember the days when relationships were started face to face and built slowly over time? The Blog Connection does too. You will learn how to balance modern technology with timeless content and your schedule. Your Blog Connection community, full of fellow bloggers of all levels, and Coach Katie are here to support you. We also understand the importance of real life connections. EVERY time our business has taken a turn for the better it’s been a direct result of a personal interaction, a connection with someone who could help us over the next hump. And - we're not afraid to use the telephone. The Blog Connection is here to guide you as you publish your message and grow your influence (and income) online. You don't know how to change things in WordPress? No problem. In our hotseat coaching sessions, we can pull up your site and walk you through it. You don't know how to find, or correctly promote affiliate products that will solve your people's products? We'll teach you. You don't know how to get that ebook or subscriber freebie created? We'll show you how step by step. and coaching for just $37 per month? Betsi is a travel blogger who started with zero page views and now gets sponsored to write about her visits to luxury resort hotels. She gave The Blog Connection a 10 for encouragement, accountability and caring community. Find out how to make the best use of the materials and resources, how to access our private Facebook group and how to contact Katie. This module is key for laying a great foundation for your business based around your message and your mission. This sets you up for success. Setting up WordPress? Here we'll give you all the insider tricks on best plugins, widgets and more, plus all the legal policies and disclosures you need to have an amazing (and legal) website! This module incorporates our $99 Business Branding Masterclass (free for members) as you learn to communicate your values through your branding. It's way more than just colors and fonts. Now your blog is up. Now it's time to write and promote. Here you'll learn about SEO, great content and traffic driving strategies. Whichever social media your people are on, that's where you need to be. In this module you'll learn the basics of quality interaction on the social media of your choice. We walk you through Twitter, Pinterest, Instagram, Facebook and Facebook Groups. This module incorporates our $99 Content Planning MasterClass (free for members) that shows you in detail how to find out what your people want, how to schedule it and actually get it done, and then how to promote it. BONUS Module 9 - GDPR Compliance - our $50 GDPR Compliance course (free for members) to teach you how to keep your privacy policies and email subscriber forms compliant with current privacy regulations. "I appreciate the support and accessibility to Katie. The Blog Connection will supply the logistics for you to answer your call, regardless of your niche or blog topic." Women bloggers who wish to grow their online business and income and/or create a product. If you have questions about whether or not this resource will work for you please reach out to Katie@bloggingsuccessfully.com. The course starts now and ends when you unsubscribe. It is a completely self-paced online course - you decide when you start and how far you want to go. We're continually adding content through our live coaching calls. When you purchase your membership, you will create an account on this bloggingsuccessfully.teachable.com and click "My Courses" to access your materials. You may also click "Connection Membership" from any page on my website. The materials are strategically organized by steps in the process, and you can download the materials for print, or just view them on your device. Online coaching workshops occur at least twice per month, and content is updated as necessary. Your membership covers all current products in the membership and future products added to the membership as long as your membership account remains active. How long do I have access to the membership materials? After enrolling, you have unlimited access to the course materials and private Facebook group for as long as you remain an active member. If your subscription expires, so does your access. Can I share your materials with others? If you are not satisfied with your membership, I am happy to refund the full amount of your purchase within the first 30 days of your purchase no questions asked. Please contact me at Katie@bloggingsuccessfully.com. No refunds are provided after the first 30 days, and we do not provide pro-rata refunds for cancelled accounts. Refund policy applies only once per user. You may cancel your subscription at any time. Yes. Current members may request to be affiliates for The Blog Connection by emailing Katie@bloggingsuccessfully.com. Once your affiliate account is approved, you will find a unique tracking link to share in the "admin" section of your account. 15% recurring commissions are paid by teachable via paypal 45-60 days after the sale. Influencers and JV partners are eligible for commissions, but need to contact us at Katie@bloggingsuccessfully.com to request an affiliate account and/or unique coupon codes and referral links. We have also provided a brief "How to be an affiliate" course for free to any of our affiliates. . Please feel free to e-mail me at Katie@bloggingsuccessfully.com with your questions. I am appy to answer questions via email or in a 1-on-1 call with you. We do not have a set date, but it generally only opens once per year. If you decide not to join us this year, be sure to watch your emails for our next opening! 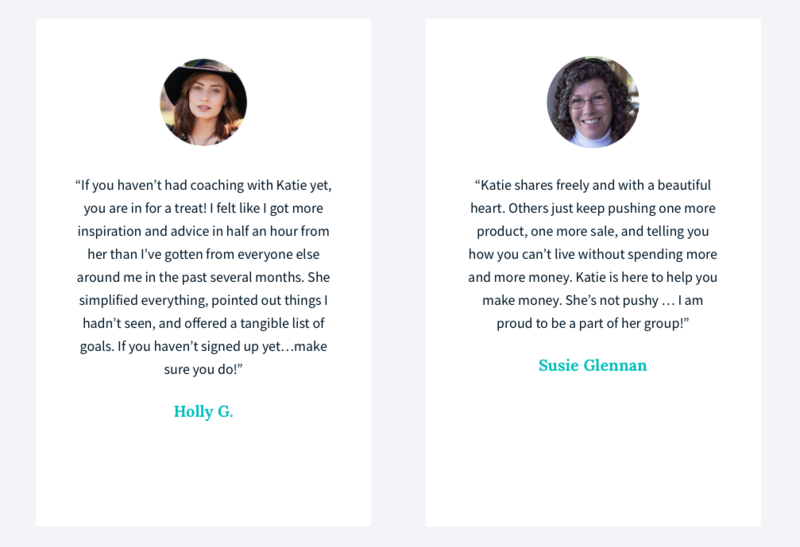 "In 3 months of working with Katie, my visitors, sessions and pageviews doubled, my subscribers increased by 700% and I made the first money I've ever made with my blog." "The Blog Connection is a place to network and get your questions answered without criticism"
"The help I found in The Blog Connection was an answer to prayer for me as a new blogger." A world-changing movement starts with a message. The Blog Connection can help you share your message with the time you already have. Let’s get started sharing your message now!